They engaged in one of the most historic Marathon duels in United States running history at the 1994 New York Marathon. Now they will run together once again at the 2019 Fitbit Miami Marathon and Half Marathon, produced by Life Time, the premier healthy lifestyle brand. 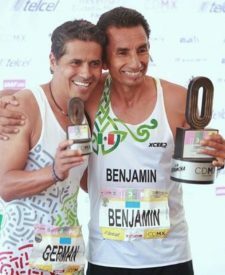 Germán Silva and Benjamín Paredes, a pair of legendary Mexican long distance runners, will make the trip to South Florida to run in the January 27 race. But this time they won’t be trying to outdo each other. They have decided to run the half marathon with “the people,” pacing themselves to finish in 1:30-1:40. It’s a grand finale of sorts for a friendly challenge Silva and Paredes made in Mexico this summer when they led their respective 10-person running teams into the August 26 Mexico Marathon. Two members of Paredes winning team will run in Miami – Alberto Marmolejo and Maria Fernanda Aguilar Alvarez – via complimentary entries provided by Life Time. Several thousand runners annually from Latin America enter the Miami Marathon and Half Marathon, with large contingents from Colombia, Puerto Rico, Guatemala, Costa Rica, Brazil, Ecuador and Peru in addition to Mexico. Silva and Paredes will be lacing up for the first time in South Florida, conjuring memories of that epic duel in the Big Apple that is still often talked about today. The two were neck and neck in the final moments of the race as the course steered out of Central Park at the 25.5 mile mark, seven-tenths of a mile away from the finish line. That’s when Silva had a momentary mental lapse and turned the wrong way. With a police officer gesturing for him to continue west toward Columbus Circle, Silva instead veered back into the park, apparently following vehicles carrying the race director, the official timer and photographers. Silva immediately recognized his mistake. All he saw was a bunch of incredulous looking onlookers instead of the crowd that had been cheering the runners on. Silva turned and saw that Paredes had continued along Central Park South. By now, Silva had taken 12 strides in the wrong direction. He panicked. He had predicted victory several days earlier. He had trained earnestly for months, running at altitude in a forest outside of Mexico City, and had survived torturous training runs up the side of a volcano. Silva, an Olympian in the 1992 Barcelona games, decided after all that, he wasn’t going to lose the race. He reversed his steps and took off after Paredes, who had gained a lead of about 40 yards. “When I saw I was in a good way, I decided to push it,” Paredes said. Silva figured he had to cut off about 12-13 seconds to make up those 40 yards. Because of his International experience, he had a strong finishing kick in his arsenal. Silva made up the gap rapidly as the runners continued along Central Park South for a final crosstown block before turning back up into the park at Columbus Circle. Just before the 26-mile mark, Silva regained the lead. As his friend went by, Paredes extended his left hand and patted Silva on the back. Paredes is thrilled the two will be running together at the Miami Marathon and Half Marathon, one of Life Time’s iconic events. With more than 600 Mexican runners expected, Silva and Paredes understand the presence they will have. They are also scheduling a Saturday shake out run and will visit a Mexico themed tent at the finish line festival in Bayfront Park after the race.